This Sunday’s Service – Honoring Dr. Martin Luther King, Jr.
Today we honor Dr. Martin Luther King, Jr., a towering beacon in the fight for justice for all. Dr. King’s words and deeds are inspiring, familiar, and comforting in their familiarity. Perhaps they are too comforting, for they speak to a time more than 50 years past. Much has changed in the 50 years since Dr. King’s death. 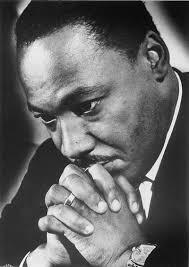 What would Dr. King ask of us today? I believe we honor Dr. King most when we continue his work, rather than enshrine it. I believe Dr. King would ask us to listen to the voices of those who have come after him, seeking justice. In honor of Martin Luther King, Jr., we will hear some of the voices of today’s black leaders and what they are asking of us, as UUs, as allies, as members of the Beloved Community. ← This Sunday’s Service – Where’s Justice in Central America?